To compete with today's increasing globalization and rapidly evolving technologies, individuals and organizations must take their ability to learn -- the foundation of continuous improvement, operational excellence, and innovation -- to a much higher level. 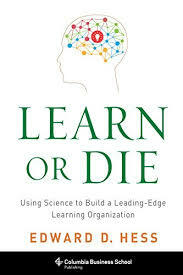 In Learn or Die, Edward D. Hess combines recent advances in neuroscience, psychology, behavioral economics, and education with key research on high-performance businesses to create an actionable blueprint for becoming a leading-edge learning organization. I have a bias towards organizational learning and I prefer to talk about learning, team learning, project learning, and the learning organization, rather than knowledge management. Learning has a more dynamic spin to it. Even when I talk about knowledge management, I end up emphasizing knowledge flows, which is nothing more than learning. What did you read in this chapter that surprised you? What are your top three takeaways that you want to reflect and/or act on? What behaviors do you want to change? To me, the first question is meant to force you to think about what was new in what you read. Reinforcing prior learning by reading things you already know is fine, but learning something new is even better. The second question is an invitation to extract something of value to YOU as the reader and to think about it further. You don't have to agree with everything you read. Very often I'll read something that's new to me and I'll come up with new questions, which might drive further readings. The third question doesn't seem to always apply, but that could be just the root cause of a lot of lessons observed and not learned. I've learned something new but I don't take any step to either verify it through my own experience or implement it in any way. I've caught myself writing "to do" notes based on readings but I don't have a rigorous approach to actually doing any of it. Some of it gets done and some of it is forgotten a day later. I've found that the best way (for me) to implement the "to do" list that emerges out of readings is to create a mini-project or mini-experiment. Second, I liked the early attention to individual learning in the book and the connection to organizational learning. "Organizations cannot learn unless the individuals within them learn." (p. 3). It sounds obvious but most of knowledge management ignores the individual aspects and goes directly to organizational level issues and strategies. I feel like a broken record about this. How much have I actually done in my own professional practice to strengthen learning at all levels, including at the individual level? 3. Compile a list of "To Do" items throughout this Book Challenge and post it with a record of actions taken in response. See the Chapter Videos provided by the author if you don't have access to the full book or no time to read the full book.